Überlingen, July 24, 2017 – Since the beginning of the year, production of SICK emission measurement devices has been underway in Überlingen. After 17 years of manufacturing in Meersburg, the move to the new site was initiated in the summer of 2016. At a ceremony on Friday, July 21, 2017, Dr. Jan Zeitler, Mayor of the Überlingen district, Dr. Robert Bauer, Chairman of the SICK AG Executive Board, Renate Sick-Glaser, daughter of company founder Dr. Erwin Sick, and a number of colleagues celebrated the official opening of the new premises. Covering an area of 5,000 m2, the building in Überlingen offers more than double the space of the former location in Meersburg. It houses some of the administrative offices, though is primarily dedicated to manufacturing and logistics. Thanks to optimized production processes, production in the new hall is around 2.8 times more efficient. The plot of land has a surface area of around 10,000 m2 and offers space for further long-term expansion. Around 80 people are currently employed in Überlingen. The move became necessary due to constant growth in the field of emission measurement devices. In recent years, the site in Meersburg has recorded high growth rates. In 2017, it is expected that more devices will be manufactured than would ever have been possible in Meersburg due to its limits in terms of capacity. Projections for this year anticipate the production of 500 devices, yet the capacity limit in Meersburg stood at around 400 units. The move therefore came at exactly the right time. “With Überlingen, we have found a new home in the region which offers us space for further expansion in the future. 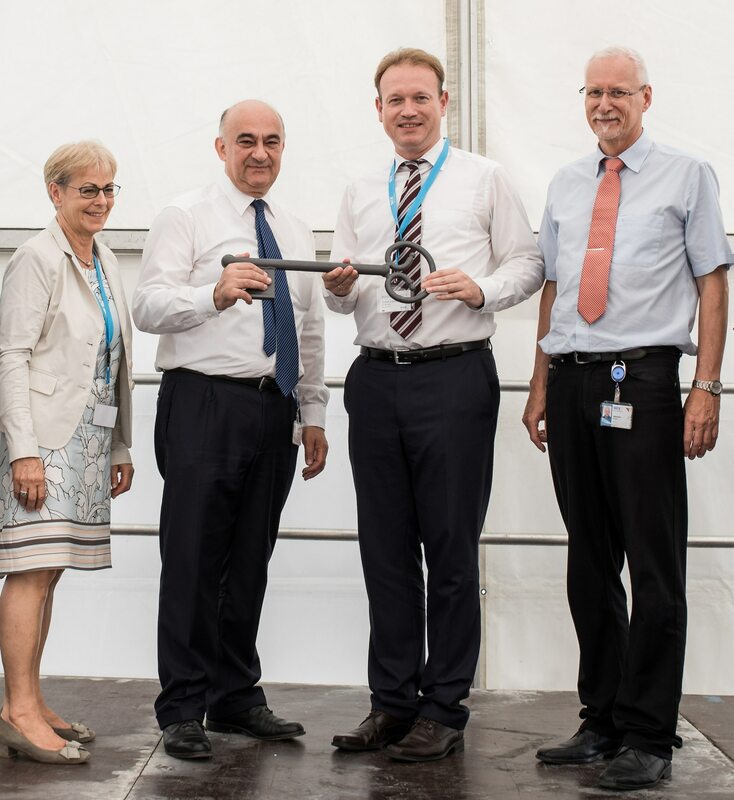 This is an important prerequisite in enabling us to continue on our current path to success and at the same time sustainably strengthen our competitive position in the field of emission measurement technology,” explained Dr. Robert Bauer, Chairman of the Executive Board, during the official ceremony. At the Überlingen site, SICK AG is represented by part of the Analyzers Global Business Center (GBC Analyzers). The site specializes in analyzers for hot-wet measurements of corrosive gases, which are primarily used in waste incineration plants or in cement factories. Core products at present include particularly rugged analyzers for monitoring tasks in emission measurement technology. A further important product is used to monitor processes in the chemical industry as well as in incineration plants. One of the most innovative products is used to measure mercury in flue gases. It takes measurements in the lower microgram range and is as such the most-sensitive measuring instrument on the market at the present time. What’s more, a ship emission measurement device is opening up a new market in the field of maritime applications. The device uses hot-wet measurement technology to monitor emissions from ships’ engines. Customer Project Management, the customer-specific project handling department, completes the site’s product portfolio. SICK is one of the world’s leading producers of sensors and sensor solutions for industrial applications. The company, which was founded in 1946 by Dr Erwin Sick and has its headquarters in Waldkirch im Breisgau near Freiburg in Germany, is among the technology market leaders. With more than 50 subsidiaries and equity investments as well as many agencies, SICK has a presence all over the world. In the 2016 fiscal year, SICK had more than 8,000 employees worldwide and a group revenue of just under EUR 1.4 billion.